In Part 2 of this series, we explored the range of responsibilities a Product Manager can take on. Now, we’ll examine how those activities will change, based on where the product (or company), is in its lifecycle, based on the three main stages: pre-product-market-fit (pre-PMF), post-product-market-fit (PMF), or the “mature” phase. As you think about “what” you should be working on, it’s first important to understand “why” you’re working on it in the first place. What stage your company is at is often the most significant indicator of this, as it has the most far reaching implications for what is most important at any given time to help the company, or team, succeed. In keeping with the 3^3 model in this series, here are three major company stages. While it’s debatable where to exactly draw these distinctions, there are clearly distinctly different set of activities at each of these stages in a company lifecycle. Let’s explore each of these three customer types in more detail. In the stage before you reach product/market fit, your overarching objective is to “figure it out”. By that I mean, honing in on what the real value you’re providing to your customers. In this stage, a PM needs to be very nimble (noticed I didn’t use the loaded term “agile”? ); your sole goal is to figure out how to dial-in your product to meet the core needs of your target customers as soon as possible. 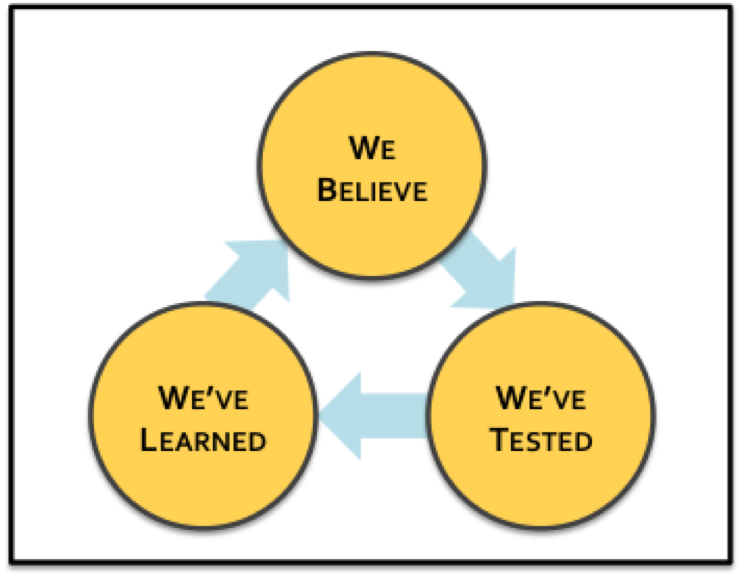 Where the “we’ve believe” is a specific hypothesis you need to test; the “we’ve tried” is a specific experiment designed to increase that understanding; and the “we’ve learned” are results you’ve accrued from running those tests. Since you may likely lack a large user base, heavily quantitative experiments, like A/B tests that discriminate between 41 shades of blue matter much less. Instead, the focus hold be on isolating big directional changes. Each turn of this wheel should happen as quickly as possible (within 1-4 weeks), each concluding with a retrospective of the results, assessing what worked, what didn’t work, and what you learned, so as to tee up the next turn of the wheel, until you’re unequivocally positive what you have will work for the larger market, because your data supports that claim. Here, it’s all about short-term goals, and quick-hit experimental iterations; you’re not writing a Ph.D dissertation, so you don’t alway need hard proof, rather good directional information that sets up the next experiment…and if you existing, or potential, investors ask you for a “6-month roadmap” (or god help you longer), that’s a telltale sign that they don’t really “get it”. Once you’ve achieved the mythical PMF stage, your next job is to scale the product / company as quickly as possible. “Scaling” is a loaded term, but the bottom line for you, as a Product Manager, is to first add to your team, and then to provide a measure of repeatability / predictability to its operating cadence. At this point, you’ve graduated out of the “figuring it out” stage to optimizing a set of key metrics, and scaling them to greater numbers of customers. To get here, you’ll first need a solid set of KPIs, along with salient and accessible reporting mechanisms for them. With these in hand, you can then develop process for prioritizing what to work on, and what resources should be put to work on it (based on estimated ROI), and thus come up with a more predictable rhythm (velocity) for the team. Additionally, you’ll now have figure out how to manage the team, as well as how to manage technical debt, among many other things that come with a growing and maturing product organization. Unlike in stages 1 & 2, where success is often based on making bets, and moving quickly, large mature companies often do their utmost to put policies and procedures in place to mitigate risk – since the overarching plan is often to “double down” on what made you successful in the first place. What this does is create two sometimes competing objectives. The first objective is to drive continued growth and optimization. Now you have tools at your disposal like granular A/B (or multivariate) testing; also heavier expenditures in driving paid awareness and promotions become cost-effective. The key is optimizing to particular metrics to drive much more longer-term predictability for the company (think quarterly and annual metrics), where the team may be incentivized to achieve, and things can run much more like a well oiled machine. What becomes harder now is that, due to the scale of the company, there are many more stakeholders in any significant product decision that need to be aligned (e.g. sales, marketing, engineering, support, finance, operations), so it becomes harder to get everyone together in a room to decide anything, and hence the needs for an “offsite” or “strategy meeting” to facilitate major decisions. Moreover, it becomes much harder to simply crank out something in “beta mode” and ship it out at-scale, since you now have a large customer base, with greater expectations of you. As a result, a PM shifts effort, from the previous stages, to focus more on upfront planning, and stakeholder communication, and a larger and more specialized PM team to cover the remainder of the competencies landscape. The second, and often competing, objective in the mature company is to continually innovate. At this point, the company’s resources are likely at a point that you could have only wished for back in the pre-PMF stage; however, it comes with a price. At mature companies, the bar to pursue new opportunities is higher, in that they must be more significant, in their ability to unlock new market potential, than smaller companies. Even more challenging, is that ssometimess, those opportunities may undermine an existing line of business. As a result, while companies at this stage can recognize new technologies and opportunities, they are often slow to adopt them, letting other smaller companies do so instead, and thus giving rise to the all-important Innovator’s Dilemma. The challenge for the product organization is to juggle both of these priorities simultaneously. With all of these stages, there are no easy answers to how to manage the challenges you’ll face; however, your job as a PM is to identify the game that you’re playing, if you want to win it. Next, in the final part, we’ll wrap-up the series looking at how all of these pieces come together, and how this framework can work for you in various practical situations.